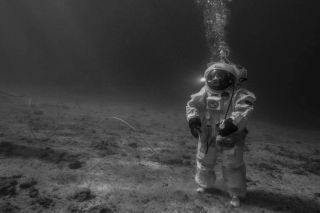 ESA astronaut instructor Hervé Stevenin ready to perform soil core sampling with a core tube and a hammer underwater off the coast of Marseille. During the mission, several soil samples were collected by the aquanauts with similar tools used on the Moon by the Apollo 11 crew. Image released Sept. 10, 2013.